Though the mouse didn't become the standard way to control a desktop computer until Apple released the Macintosh in 1984, it was first invented 20 years earlier by a visionary World War II veteran named Douglas C. Engelbart, who passed away this week at the age of 88. Left: Douglas C Engelbart with an early computer mouse in 1968 (Photo via SRI International). Right: Apple's Magic Mouse, launched in 2009. Engelbart's legacy will live on as the pioneer who showed off the first mouse in 1968 at the Fall Joint Computer Conference in San Francisco, Calif. There, according to The New York Times, he showed more than a thousand of the world's leading computer scientists a method of controlling a computer with a mouse and keyboard. "In little more than an hour, he showed how a networked, interactive computing system would allow information to be shared rapidly among collaborating scientists," reporter John Markoff wrote. "He demonstrated how a mouse, which he invented just four years earlier, could be used to control a computer. He demonstrated text editing, video conferencing, hypertext and windowing." Born in Portland, Ore., on Jan. 25, 1925, Engelbart was a graduate of Oregon State College who was drafted late into World War II. He spent two years in the Navy as a radar technician, and later received a Ph.D. at the University of California, Berkeley. The first computer mouse was publicly unveiled in 1968 by its inventor, Douglas C. Engelbart. He invented the computer mouse in 1964  two decades before it would ship with the first Apple Macintosh. The idea occurred to him when attending a computer graphics conference, and he was brainstorming ways to move an onscreen cursor. Early mouse hardware could only accommodate up to three buttons, but Engelbart felt that future versions could have up to 10 buttons for greater control options. Apple co-founder Steve Jobs famously had a very different approach, limiting the Macintosh mouse to just one button for simplicity. The mouse remained an obscure computing accessory until Apple released the Macintosh 128K in 1984. The mouse that shipped with that mass-market system was actually a slightly updated version of the mouse created for the Apple Lisa  a less popular personal computer that was released a year earlier. The first Macintosh Mouse, model M0100, featured a rubber ball for tracking, and connected to the Macintosh through a DE-9 connector. Apple has continued to evolve the mouse over the years, most recently with the multi-touch-capable Magic Mouse, released in late 2009. 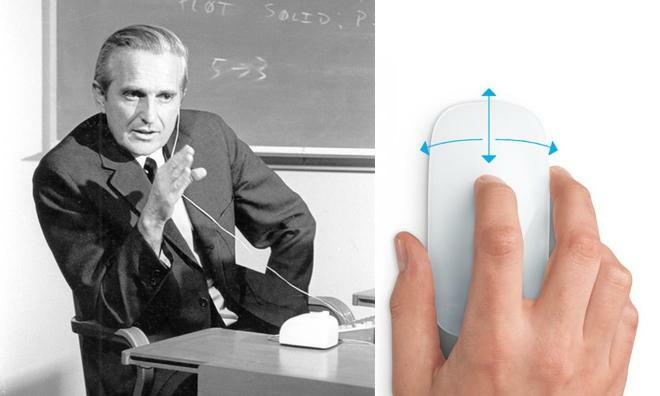 While the Magic Mouse is vastly different from the first Macintosh Mouse, it and most other computer mice still adhere to the same concept first invented by Engelbart in 1964. Modern mice have replaced track balls with lasers and now connect wirelessly, usually via Bluetooth, to computers.